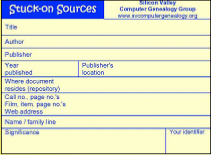 Occassionally the Silicon Valley Computer Genealogy Group (SVCGG) develops tools that we believe can be useful to anyone researching family history. The current tools developed by the SVCGG and available to members and nonmembers are listed below. Stuck-on Sources are pads of "sticky notes" (real Post-It(© 3M) notes) pre-printed with blanks for the information you need to keep track of source information about your photocopies, letters, and other documents. We designed these ourselves after a long research trip that generated a mountain of photocopies. Online ordering is available through our online store. We accept major credit cards.